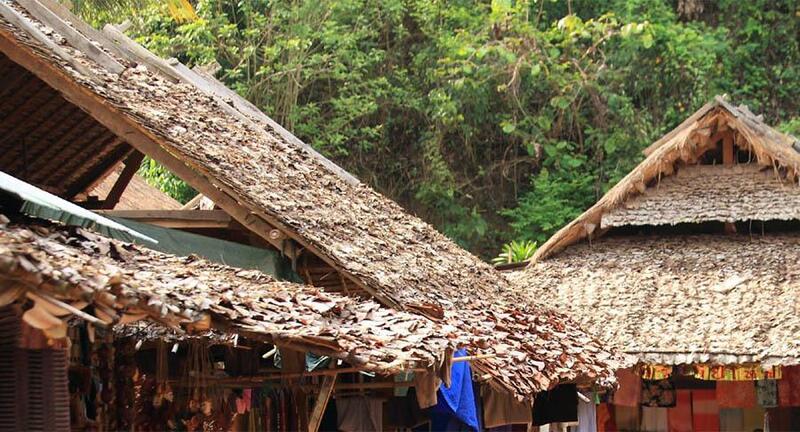 Photo Gallery of a hill tribe village - Ban Huai Sua Tao which is well-know for the long neck tribe in Mae Hong Son of Northern Thailand. The village, Ban Huai Sua Tao. 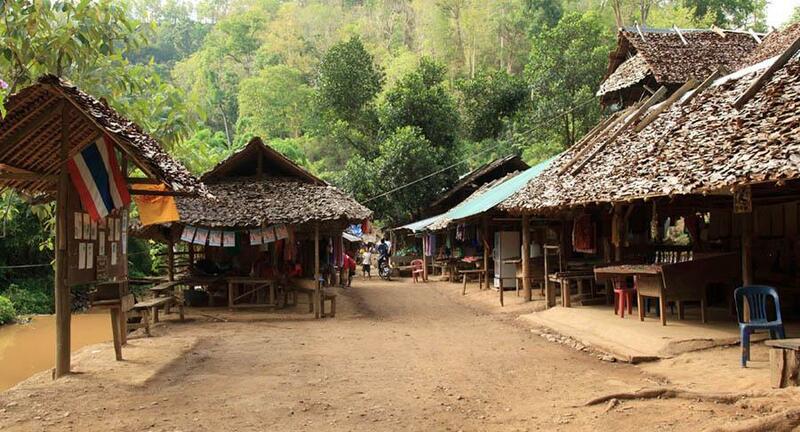 A cozy village, smaller than Ban Nai Soi I visited before that was said to be the largest village of the Long Neck Tribe in the three in Mae Hong Son. 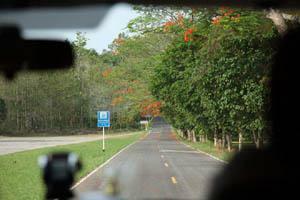 Mae Hong Son is about 300 km to the northwest from Chiang Mai, and it's close to the border between Thailand and Myanmar. It will take about 40 minutes from Chiang Mai by air (if my memory is correct. :D ). 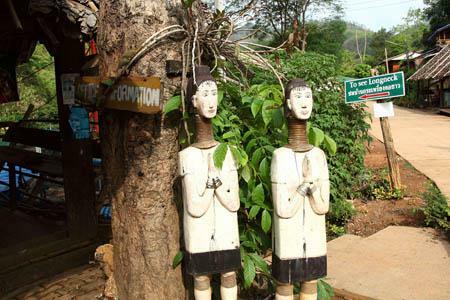 Mae Hong Son is famous for Long Neck Tribe (Ban Nai Soi or the village on this page), the beautiful temples at the edge of a lake, Wat Chong Kham / What Chong Klang and the temple on top of a mountain, Wat Phra That Doi Kong Mu reported on a different page. 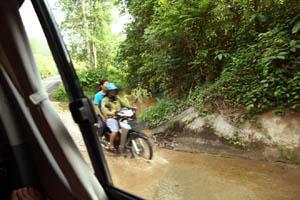 Check out the Mae Hong Son top page for other spots. 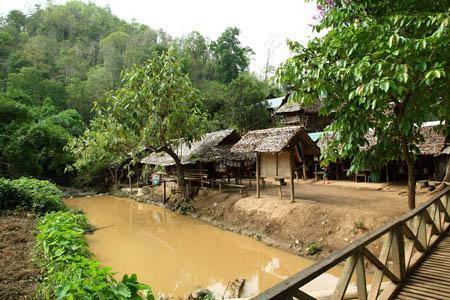 There are three village of Long Neck Tribe in Mae Hong Son as follows. 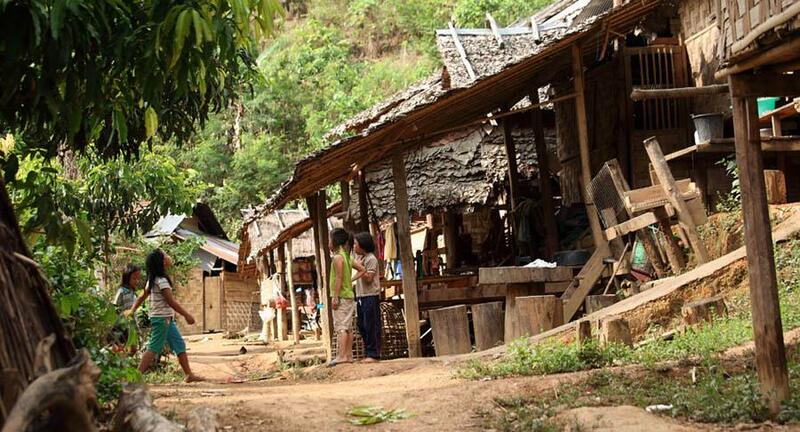 I visited another village before called Ban Nai Soi that is said to be the largest in the three villages, and this time, I dropped by another village, Ban Huai Sua Tao on the way to Pai. 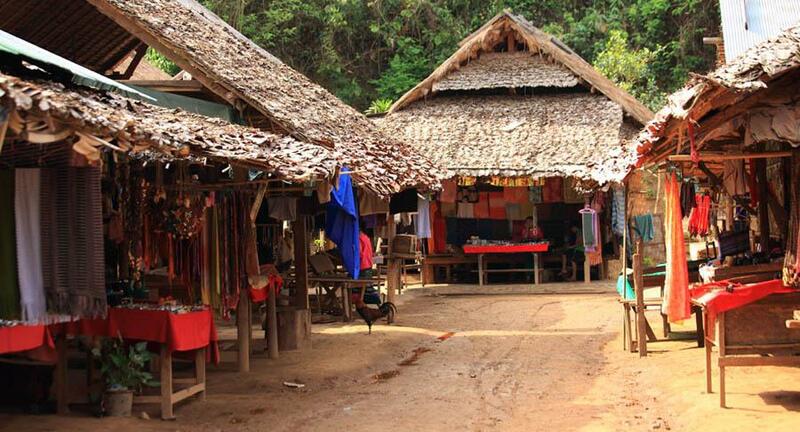 Ban Huai Sua Tao is a village of Long Neck Tribe, the closest from Mae Hong Son city of the three villages. It takes about twenty minutes by car from the Phraya Singhanatracha Memorial (the monument of the first governor of Mae Hong Son) that is located at the foot of Doi Kong Mu. This village is explained as follows by a notice on a bulletin board around the entrance of the village. 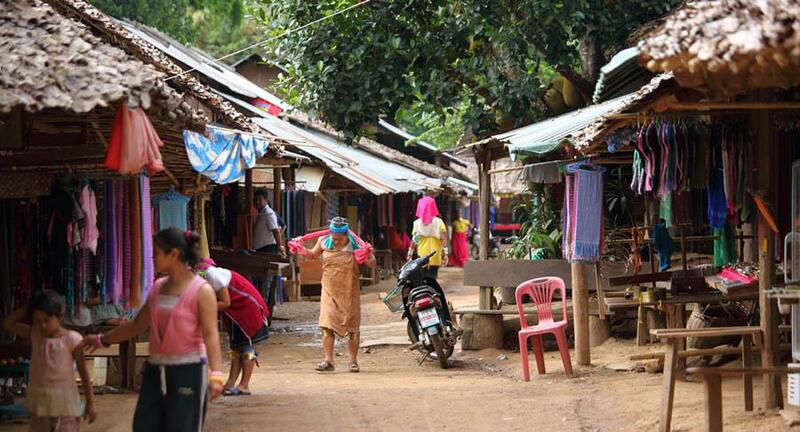 The people of Huay Sua Thao are karenni refugees who have fled from persecution in Burma (Myanmar). 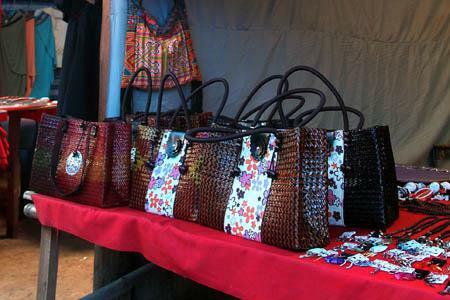 They belong almost exclusively to one of two Karenni subgroups, the Kayan and the Kayaw. The Kayaw, commonly referred to as the long ears or big-ears are a separate group from the Kayan with their own language and traditions. 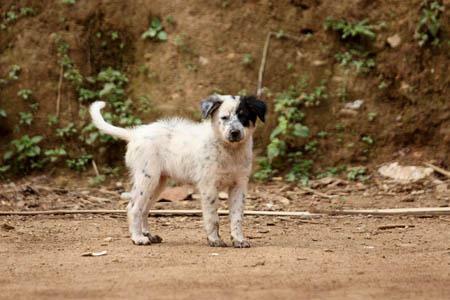 [Ban Huai Sua Tao] Let's go to the village ! [Ban Huai Sua Tao] History, religion and so on. There is a river running across the way but it's not so far; just 20 minutes drive from the Phraya Singhanatracha Memorial (the monument of the first governor of Mae Hong Son) located at the foot of Doi Kong Mu. A well-paved road at first. A view on the way. Corn fields ? Go in a little river. A well-paved road at first. A view on the way. Corn fields ? Go in a little river. Now, we got there, the village, Ban Huai Sua Tao. Two long neck women welcome you with hands together around their chests at the entrance. Around the entrance of the village. You have to go across the bridge. Two long neck women welcome you with hands together around their chests at the entrance. Around the entrance of the village. You have to go across the bridge. Around the entrance of the village. 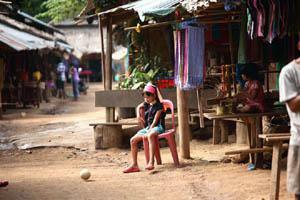 It's a cozy village, and looks smaller than Ban Nai Soi that I visited before. 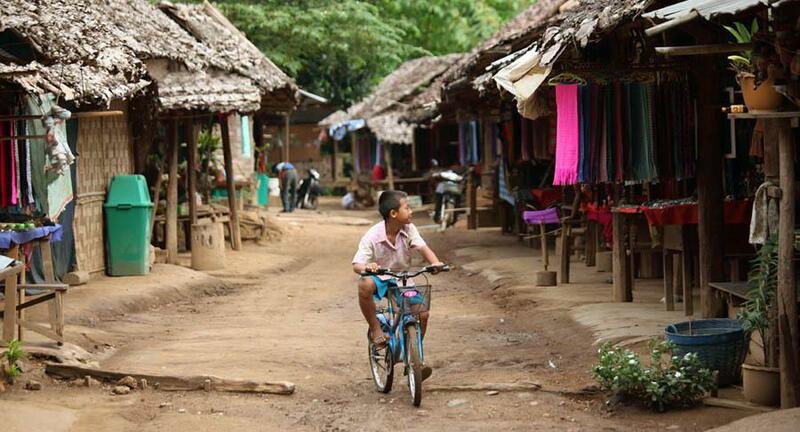 This village is not a theme park but a place where people spend their daily lives. Please pay courtesy to them. You'll see what the villagers look like in this section. There is a bulletin board around the entrance and it shows messages in English from the villagers to visitors as follows. 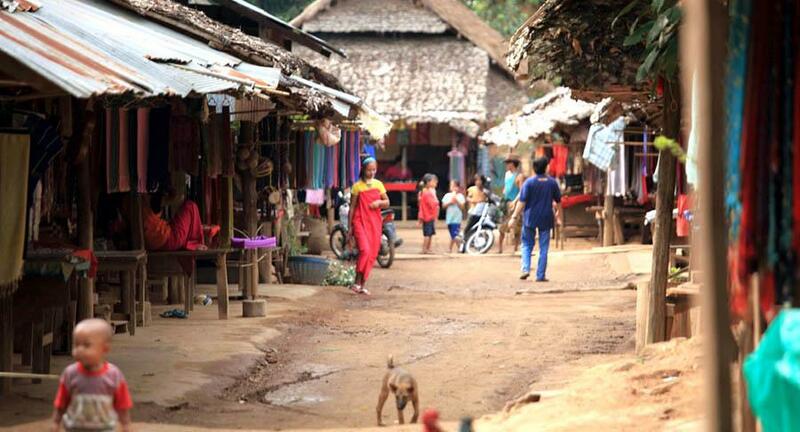 This village is not a theme park but a place where people spend their daily lives. Please pay courtesy to them. We welcome you as a guest in our village, but as that you respect that it is a village where everybody carries on their daily life. It is not a specially built theme park and as such you should not leave littler or walk into peoples' houses without invitation. 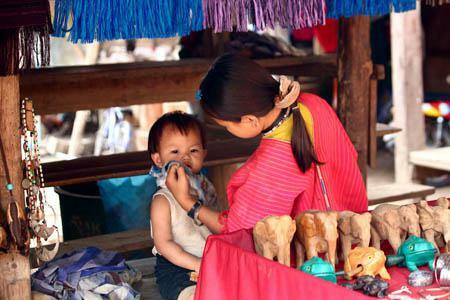 The people of Huay Sua Thao are used to visitors and are happy to pose for photos, but please ask first. It would be a good gesture to purchase from their shop in return. The girls who wear the rings, in particular, are often happy to speak to a few visitors to the best of their ability. Please use discretion when it comes to asking personal questions. About " long neck ", only women, who were born on Wednesday, make their neck long. Long, long time ago, there was a scary happening. Only women who were born on Wednesday were bit and killed by a tiger. 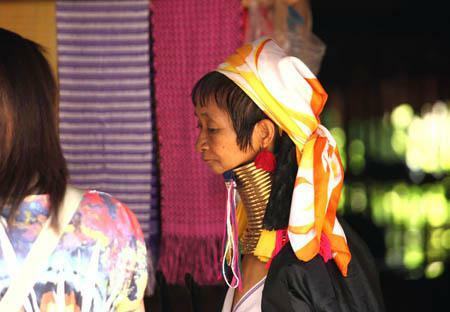 To protect those women from the tiger, people put neck ornaments on their neck. This is one theory and it looks like there are some other theories. I don't know if this is true or not but women born not only on Wednesday also wear neck ornaments for fashion. 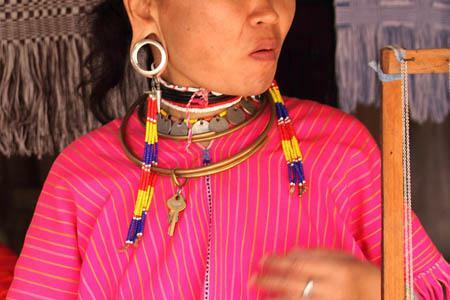 A ring-wearing Kayan woman. She will welcome you with a smile at her shop. 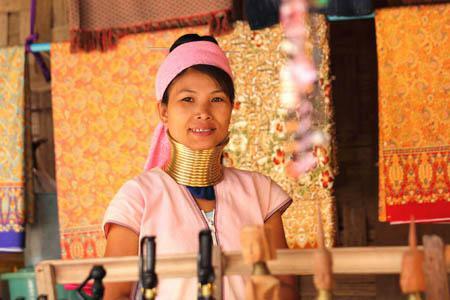 Ring-wearing Kayan women. They will welcome you with smiles at their shops. 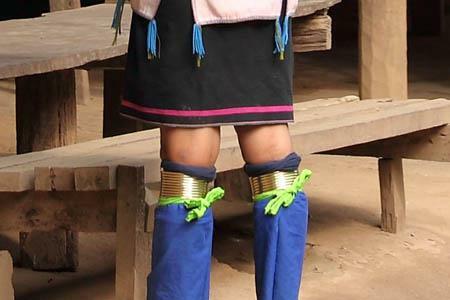 A ring-wearing Kayan woman from behind. The rings are tiered about 17. They wear rings around their knees as well. 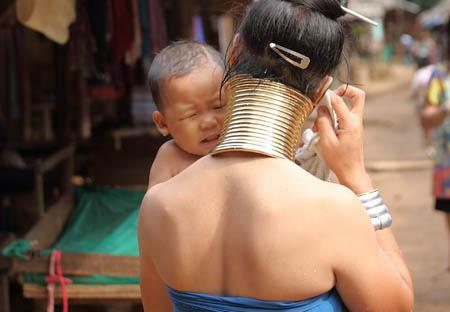 A ring-wearing Kayan woman from behind. The rings are tiered about 17. They wear rings around their knees as well. 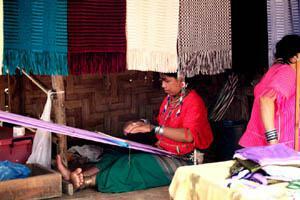 Women who are weaving.. ? A woman is weaving. She looks one of the Kayaw, the long ear tribe. 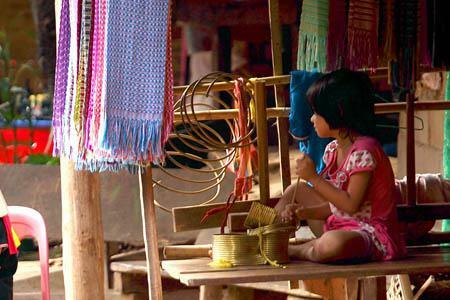 Women who are weaving.. ? A woman is weaving. She looks one of the Kayaw, the long ear tribe. Are their necks really long ? Their necks are actually not long. The neck rings press down their shoulders and it makes their necks look longer. You will see the details in the page below with some pictures. Women are together. I'm interested in what they are talking about. One of the Kayaw tribe (long ear tribe). She wears a big ring. The path next to the main street. Kids are playing. She wears various kinds of rings. Is she going to wear the rings Long neck women do ? The path next to the main street. Kids are playing. 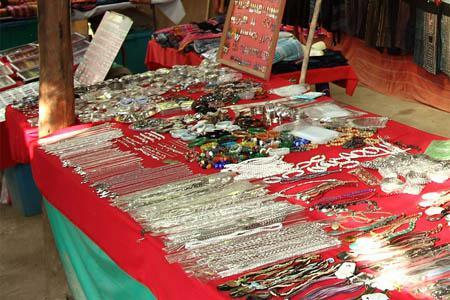 She wears various kinds of rings. Is she going to wear the rings Long neck women do ? 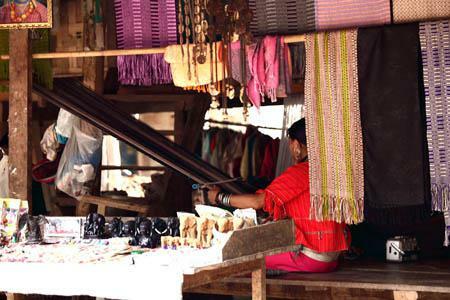 A weaving woman. She is a Kayaw (Long ear tribe). A girl wearing rings. A weaving woman. She is a Kayaw (Long ear tribe). This section shows their history, religion and so on. 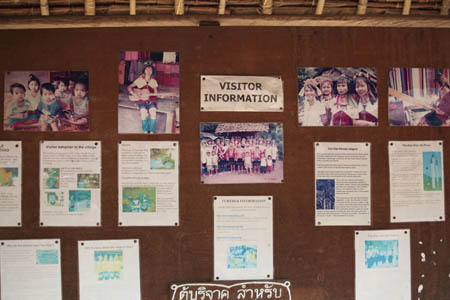 The bulletin board of the village around the entrance shows their history, religion of the Kayan people (Long Neck Tribe) as follows. There are not a lot of opportunities to learn about them. This is very curious. It's a must-read when you visit here. 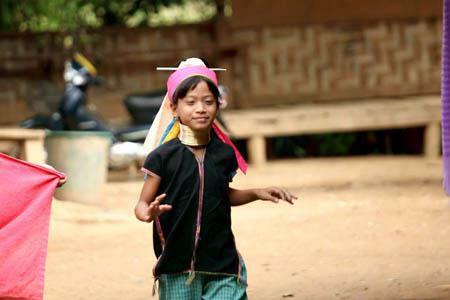 The Kayan people have practiced their traditional Kan Khwan belief since they emigrated from Mongolia during the Bronze Age and started their wanderings towards the Salween River area in Karenni State (in present day Burma). 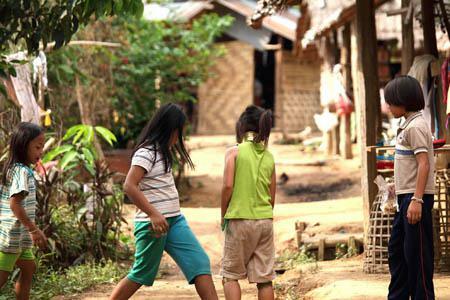 They lived there until they became displaced people in the 1990s as a result of the actions of the Burmese military junta. 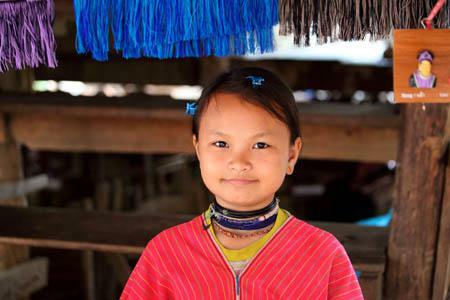 Although some Kayan people have converted to Christianity many still follow their traditional Kan Khwan beliefs and at festive times of the year everyone participates in the ancient ceremonies. The world was created by the eternal creator god Phu Kabukathin, assisted by two creator deities: Pikahao and Kabukaban and their four Messengers: Mann created heaven, Ti created the earth, La Taon created trees and plants and La Nan created man and animals. The components of the universe are linked together by a web; thus the earth is braced to the stars and the moon by a spider's web. At creation earth still lacked density and the land and the water were fluid so the God Phu Kabukathin planted a small post in the ground. As the post grew the earth also grew into seven outer and inner layers and it became firm. The post was named: "The means of formation of earth" - the Kan Htein Bo in Kayan. For the stability of the world and mankind everyone should pay homage to the Kan Htein Bo bestowed by God. God also gave the people seven commandments to guide their lives. On their wanderings the Kayan often tried to plant Kan Khwan poles, but they never remained firm until they reached Demawso where they settled. The pole is comprised of The Sun at the peak - venerated as the only self-illuminating planet in creation. Next to it is the Moon, the Sun's mate and man's means of telling the time. Then comes the Sanctuary - where the eternal deities reside and the streamer - a ladder connecting heaven and earth, at the top of which is a spider's web which humans must pass through to reach heaven. Next to the Kan Htein Bo is a podium, the Kantan, where offerings are placed to the Gods and to the guardians of the woods, lands, mountains and waters. Around the end of the main street with many gift shops along. Roofs of the shops. It looks they are covered by leaves or something like that. A kid enjoy riding on a bicycle. Gift shops are like this. Bags. I like this design. Gift shops are like this. Bags. I like this design. 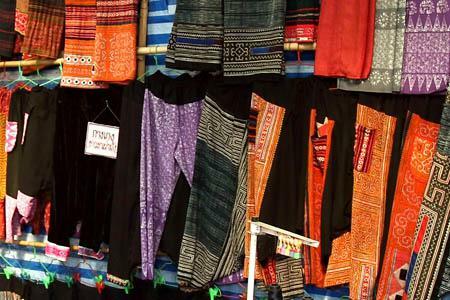 Hill tribe designed clothes. They are for children, right ? 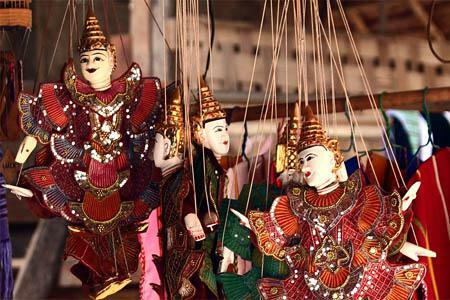 They sell interestingly designed marionettes Hill tribe designed clothes. They are for children, right ? Around the entrance to the village has a lot of shops. 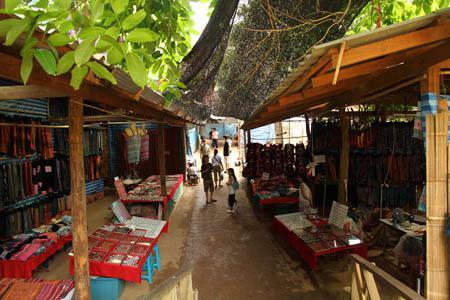 Around the entrance to the village has a lot of shops. Easy pants. Accessaries. Jack fruit. 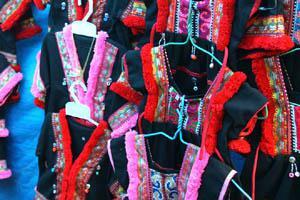 They are called Kanun in Thai. Beautiful purple blossoms. I have no idea of its name. 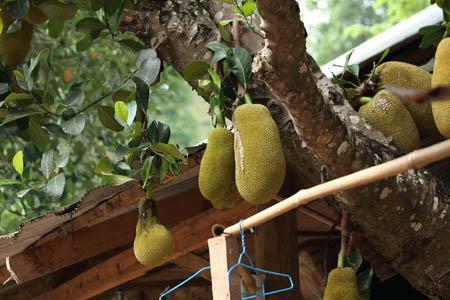 Jack fruit. They are called Kanun in Thai. 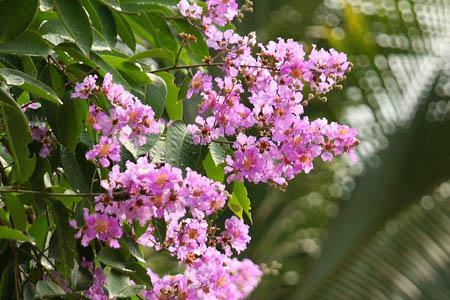 Beautiful purple blossoms. The bulletin board around the entrance. The bulletin board around the entrance. It shows the people here, their history, religion and so on. Let's check here when you visit this village. 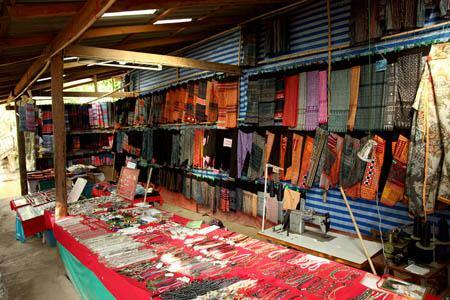 If you are interested in Mae Hong Son, check out the Mae Hong Son top page for other spots ! 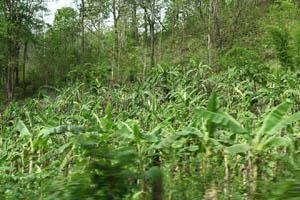 The village of hill tribe people opened in 2005 in Chiang Mai, Baan Tong Luang Eco-Agricultural Village is here. the certificate of arrival !